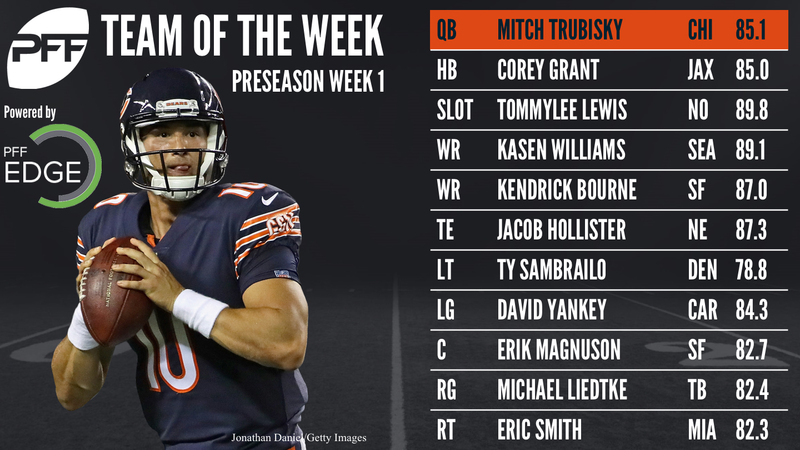 Trubisky was kept clean on 71.4 percent of his drop backs against the Broncos, and the rookie took advantage of his stellar pass protection by throwing for a perfect 100.0 percent adjusted completion percentage on those 19 unpressured attempts. While his average time to throw was 3.10 seconds, eighth most for the week, he did excel when getting rid of the ball quickly going 8-of-9 with a touchdown on passes thrown within 2.5 seconds or less of the snap. Trubisky also helped his cause by going 4-of-4 on intermediate throws (10-19 yards) and 5-of-5 on play action passes. Grant showed off his impressive wheels in burning the Patriots for a 79-yard touchdown run, helping to lead them to a seven-point victory over the defending Super Bowl Champs. Thanks in no small part to that long run, Grant boasts a ridiculous 12.5 yards after contact per attempt so far this preseason and he has forced four missed tackles. Williams caught four passes against the Chargers, all of which went for at least 28 yards apiece. All four his receptions came against undrafted rookie Michael Davis, targeted outside the numbers to left, over 20 yards downfield. His four deep balls caught were the most of anyone this week as no receiver had more than two such catches. Bourne showed Friday night that Cooper Kupp is not the only talented rookie receiver to come out of Eastern Washington, catching four balls for 88 yards and a touchdown. He had a 141.4 passer rating when targeted, and caught both deep passes thrown his way for 66 yards. Bourne only ran 14 routes, but was targeted on seven of them and finished with an average of 6.29 yards per route run. Lewis saw a league-high 11 targets come his way this week, and he took advantage catching 10 for 124 and a touchdown on his way to earning a receiving grade of 90.1. Of his 34 snaps in route, 26 came from the slot where he earned 2.15 yards per route run, second-best rate for the week (minimum 12 snaps in route from slot). Lewis caught the one deep pass thrown his way, and finished the game with a passer rating of 143.9 when targeted. Jacob Hollister is the latest Patriots tight end to make a splash in the preseason, catching 7-of-9 targets for 116 yards and a 118.8 passer rating when targeted. It didn’t matter who the Jaguars put in place to try to cover him, as he caught balls against six different defenders. Hollister doesn’t offer much in the way of blocking as his 43.9 run blocking grade would suggest, but his 88.4 receiving grade was easily the best of all tight ends, and that will go a long way to helping his cause to make the team’s final 53-man roster. The former second-round pick had a perfect 100.0 pass block efficiency against the Bears’ second-team, not giving up a single quarterback pressures on 16 pass block snaps. Sambrailo was also above average in his run blocking, earning a 79.9 run block grade on 12 run snaps. Yankey earned the highest game grade of any offensive lineman this week with his 84.3 overall grade while working with the reserves along the Carolina offensive line. He did not allow a quarterback pressure on 15 pass block snaps, and earned an impressive 86.3 run block grade on his 15 run block snaps. The 49ers rushed for 188 yards as a team, thanks in part to Magnuson and his 85.4 run block grade. The undrafted rookie free agent out of Michigan played 39-of-79 snaps and was the only 49ers offensive lineman to finish with an overall grade above 72.0. Also, on his 13 pass block snaps, Magnuson did not allow a quarterback pressure. Liedtke led all Buccaneers offensive linemen with 48 snaps, and was equally impressive in both his run and pass blocking, earning at least an 81.7 grade in both facets. He did not allow a hit or a sack on 32 pass block snaps, and earned a pass block efficiency of 97.7. Smith was the only Dolphins offensive lineman to grade above a 72.0, while playing all but 3-of-58 offensive snaps. His run block grade of 92.4 was the highest of any offensive lineman this week. Smith allowed two quarterback pressures on 29 pass block snaps for a pass block efficiency of 94.8. Breida, who’s 26 snaps were the most of any 49ers running back, did most of his damage running up the gut of the defense. His six missed tackles forced were the most of any running back this week, and all of which were on attempts run between the guards, and out of his 40 yards rushing, 25 came after contact. Breida chipped in a couple receptions as well, and did not allow a pressure on his three pass block snaps. Qualls fielded the league’s highest grade for an interior defender at 89.1, while also seeing the second-highest pass-rush grade among DIs at 88.2. Qualls was a menace to the Green Bay offense, racking up five total quarterback pressures on 21 pass-rushes, good enough for a pass-rush productivity of 17.9, tops among any DI who logged at least 10 snaps against the pass. Smith finished the week as the only edge defender with a pass-rush grade above 90.0, with a 92.0. While he did not have a sack, he generated seven total quarterback pressures, most of any player. He was equally effective attacking both sides of the formation, with three pressures on 12 rushes from the right side and four pressures on 11 rushes from the left side. Bower finished his day with a sack, a hit, three hurries and a batted pass in a productive pass-rushing effort at Buffalo in which he played 47-of-74 possible snaps. Bower also had two run stops on 10 run snaps for a 20.0 run stop percentage. Reeves-Maybin excelled in coverage, allowing just 0.42 yards per snap in coverage, and averaging a whole 13.0 snaps in coverage, per target and reception. On his 26 cover snaps, he gave up just two receptions for 11 yards while making two defensive stops. His coverage grade of 87.5 was the best of all linebackers this week. Wilson earned the highest overall game grade of all linebackers this week with an 87.2. He allowed just one reception for seven yards on three passes thrown into his coverage. Wilson was used to rush the passer just five times on his 36 snaps, but successfully generated pressure on three of those snaps, two of which being quarterback hits, for a massive pass-rush productivity mark of 45.0. On his eight coverage snaps, Burgess did not allow a reception and only saw a single pass thrown into his coverage. While he was only used to rush the passer twice, he was consistent against the run and in coverage as one of only two linebackers to earn both a run defense and coverage grade above 80.0. Marley, the second-highest graded linebacker this week, was sent after the quarterback eight times, and generated pressure twice for a pass-rush productivity of 21.9. He finished with three total stops and not a single missed tackle on 38 defensive snaps. Jordan finished as the only cornerback with an overall grade above 90.0. His 34 snaps in coverage were second-most at the position and he saw five targets, but allowed just one reception for 11 yards. Jordan broke up two passes and allowed a passer rating of just 39.6 into his coverage. Pipkins was on the field for 32 snaps in coverage, and allowed two receptions for just four yards. He had three tackles including a stop and zero missed tackles, while adding a pass breakup and a quarterback hit. On his 26 snaps in coverage, Middleton saw two passes thrown his way, both of which fell incomplete. He broke up one pass and quarterbacks had a 39.6 passer rating when targeting him. He also added a stop against the run, helping him to earn both a run defense and coverage grade of at least 84.0. 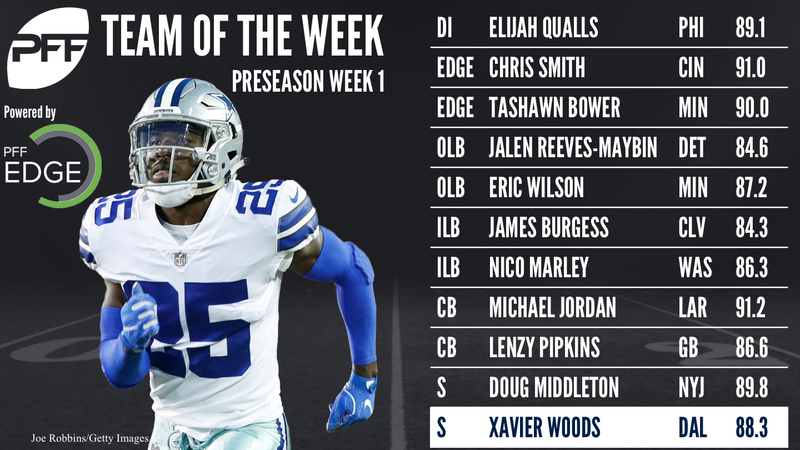 Woods led Cowboys safeties with a run stop percentage of 16.7 on 12 run snaps. His eight tackles and six total stops both led all safeties, and he did so while not missing a single tackle. He gave up five receptions though for just five yards per reception, and added a pass breakup as well. Bullock went 2-of-2 on field goals, connecting from 49 and 54 yards. He also added two touchbacks with an average kickoff distance of 70.3 yards. Redfern had a long punt of 61, and an average of 48.4 on eight punts, five of which were fair caught. His five punts inside the 20 were most for the week. He hit a max of 5.14 seconds hang time, which was the third-best mark on a punt this week. Davis earns the special teamer of the week spot due to his 68-yard punt return for a touchdown. He also added a 26-yarder on his second attempt as well. *While there are other players who played well, those limited to less than 25 percent of their respective team’s snaps were removed from consideration on this list, due to their small sample size.